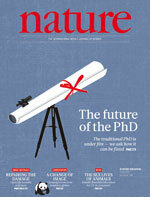 Revealing its desire to compete with People and Parade magazines, Nature's April 21 cover was about the problem of an over-supply of PhD's. (Yes, we're a bit late getting to this, but we were away the week this appeared.) This may have at least something to do with science, though seems hardly at the level of the discovery of the infamous Higgs boson or a new Hominid fossil, or life on Mars, that a real science journal should be publishing. This kind of gossip story sells lots of copy and was without doubt much more widely read than their science stories in the same issue. It's only natural, as we're sure the editors knew, that we care about our profession more than about somebody else's research. The problem discussed is the glut of PhD's being churned out in many of the long-developed scientific countries like the US and Europe. The article in a sense bemoans the over-training, a shocking waste of personal skill resources, but tries also in a sense to mollify it by saying that getting a PhD provides broader skills than your own narrow research (e.g., shape variation of the middle toe-nail in a remote Australian mole, analyzing its genetic basis with whole genome sequencing in 10,000 wild-caught individuals). Yes, PhD training will go beyond such penetrating insight, and make you a much better cab driver--you can talk more cogently with the scientists you're taking to their hotel, and that way get bigger tips. But Nature could, at least, provide a more penetrating analysis of the subject. However, that might be too critical of its readers and dangerous for its audience. That's because the reason for the glut is our gluttony. Universities used to be for teaching tuition-paying students it has been said, but those days are long gone. Universities are now for self-perpetuation via the advancement of their professors' research careers. In the status-seeking environment of the last few decades, our jobs are secured not by teaching undergraduates (except to the extent we really can't escape it), but by cranking out graduate students, whom we pay to come do our work for us. That may sound like sound university business, since it involves students, but the reason we need graduate students is to count score relative to our peers, and to have serfs to chain to lab benches to do what is needed for us to augment our other score cards--our publication and grant portfolios. Let our PhD's fend for themselves--they're adults, after all!--because the name of the game is to advance our own careers by producing even more of them! We're not alleging that faculty do not truly care for their graduate students (and post-docs, who comprise Yellow Cab's minor league holding company), because we absolutely do. Most of us work very hard to help them, and all the right things. But we know that exponential growth is not sustainable, and that if every lab in every department in every university is gushing doctoral graduates, there will not be jobs for them. The late 20th century growth was an anomaly. But all of this serves many self-interests, including the crazily proliferating science journal and other electronic news and entertainment media industries that consume science stories like elephants consume peanuts. They don't want it to slow down. There's no easy answer, unless it is for professors to do their own work in their own labs, and to scale back the amount of research they do, or for us to return to the days when graduate students were mainly trained in the Snob schools. That probably wasn't very good either. There would suddenly be a shortage of taxi-drivers. Something that professors need to do for undergrads is make them squirm until they can explain why they want to get a Ph.D. and at the same time, talk them through all the possible outcomes of grad school BEFORE agreeing to write recommendation letters in support. These are people's lives, not numbers for bragging to the administration. Just because I went straight to grad school doesn't mean my advising should be so limited. That's just lazy. I suppose one of the most difficult parts of this is that all university doctoral programs want to survive, while doctoral students are a requirement for that survival. That is of course exactly right. And it's not a new idea, as being open to all (universities, and with opportunities of all sorts for students) is a result of opposition to quotas and trade guilds that limited their membership and, of course, also kept it within closed circles, families, and so on. The 'market' doesn't effectively provide a humane damper for the system. If the status and reward system were changed, to educating students for careers in science that were in the private sector or K-12 teaching or things like that, rather than grant-based research, then there could be some natural evolution towards what would probably inevitably reinstate the status-schools as the main doctoral training grounds.